-Bear RIGHT at end of William Floyd Parkway onto Route 25A East. -Turn LEFT at the light by the Speedway Gas Station onto Wading River Manor Road. -Bear LEFT at the end of the road onto North Country Road. -Make a quick sharp RIGHT at the fire department onto North Wading River Road. 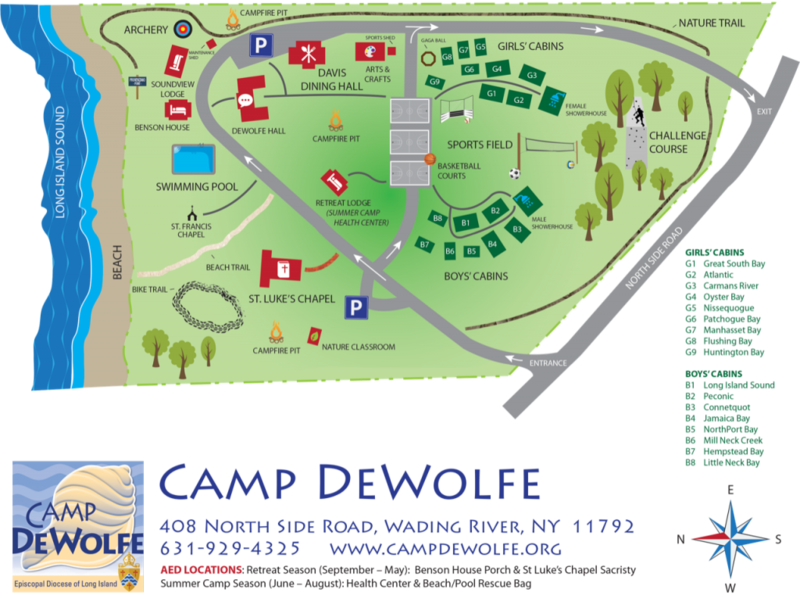 -Turn LEFT at the blue sign for Camp DeWolfe, onto North Side Road. -Turn RIGHT at the sign for Camp DeWolfe. -Turn RIGHT onto Route 25A West at the Sunoco Gas Station. -Turn RIGHT at the light by the Speedway Gas Station onto Wading River Manor Road. -Make a sharp RIGHT at the fire department onto North Wading River Road.